30 Jan 2019 --- Among staple nutritional trends, such as plant-based, low carb and high protein, bone broth is also being highlighted for its nutritional value and health benefits. The substance is touted as promoting gut health, easing joint pain and fighting inflammation. 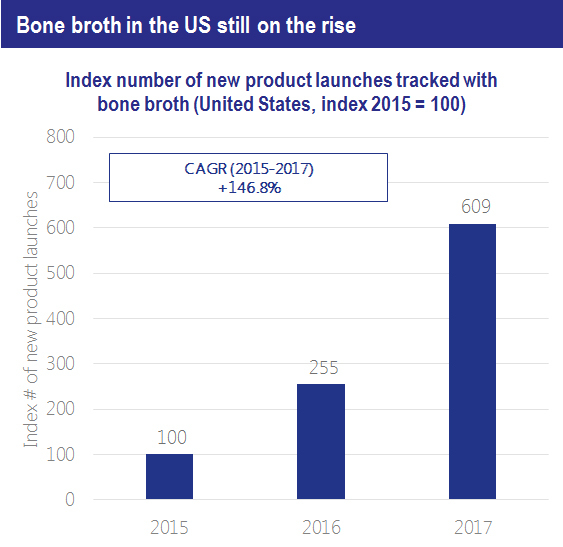 Innova Market Insights has reported over six times as many products marketed as containing “bone broth” in 2017 as in 2015, with a CAGR of 147 percent. The process of making bone broth includes simmering animal bones in water, which releases collagen and an array of proteins that are the basis of its health benefits. “Bone broth is rooted in a long history of human use and is understood by many consumers as a real food ingredient. As a versatile ingredient it makes an excellent addition to many diets and can be used in a multitude of dishes,” Irene Plats, Essentia’s Global Marketing Director, tells NutritionInsight. The use of bone broth dates back to almost ten centuries ago. Scholar Hildegard von Bingen began to recommend the serving of broth made from calves’ feet as a remedy for joint complaints. During the Napoleonic Wars at the beginning of the 19th century, bone broth was consumed as a source of protein. “Its long history proves that it is not a simple trend, but a practice with a proven track record of multiple health benefits,” Pauline Huang, Peptan's Product and Brand Manager at Rousselot tells NutritionInsight. Healthy cartilage is key to healthy joints and understanding the role of collagen as the main tissue has increased among consumers, claims Huang. Many of the nutritional benefits associated with bone broth can be attributed to one of its key ingredients: collagen peptides. Collagen peptides can be extracted from bone through a process of long, slow cooking and sometimes by adding vinegar. This process breaks down the molecular bond that exists in between long strands of collagen to peptides. On an industrial level, this is achieved through a process of controlled enzymatic hydrolysis. When broken down, collagen becomes small peptides that can be easily digested and absorbed. Collagen peptides are an ingredient that can be found in bone broth, or in its original powder form if extracted via controlled enzymatic hydrolysis. They are highly bioavailable, fat-free and have a 97 percent protein content on dry weight. They act as building blocks, renewing body tissue cells, such as skin, bones and joints. “It has been proposed that collagen peptides may act as a messenger to the cells, triggering the synthesis and reorganization of new collagen fibers, thereby supporting our tissue structure,” Huang explains. 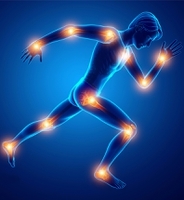 Numerous scientific studies have demonstrated collagen peptides’ health benefits, especially in the area of joint health, according to Rousselot. Another ingredient extracted from cartilage that can be found in bone broth is Hydrolyzed type II collagen. “Recent scientific studies have highlighted the capacity of Hydrolyzed type II collagen to benefit joint health at a low daily dosage. Rousselot’s Peptan Hydrolyzed collagen type IIm, for example, has a natural matrix that contains both hydrolyzed collagen type II and Glycosaminoglycan (GAGs),” says Huang. Taken at a daily dosage of 1-3g, Peptan IIm can offer a multitude of joint-health benefits. These include providing cushioning and lubrication to the joint environment, protecting cartilage and helping to reduce inflammation, she notes. Both hydrolyzed type 1 and type 2 collagens are cold water-soluble and highly bioavailable, according to Rousselot. Product launch activity for bone broth is growing in Europe and the US. West Europe, which accounts for 58 percent of reported launches is the most active area, but it is far more traditional in focus than the US, where growth is occurring, according to data from Innova Market Insights. “When witnessing the traction bone broth has gained in the US over the last 3-4 years – not just for RTD broth, but for a wide range of beverages from coffee to different sports nutrition applications, we believe that bone broth is a promising ingredient,” mentions Plats. Innova Market Insights reports that while the key market category globally for bone broth products is meat, fish and eggs (34 percent), the fastest growing market sub-categories are juice and juice drinks (+500 percent); meat products (+278 percent), and soup (+125 percent), albeit from very small bases. Click to EnlargeAncient Nutrition Organic Bone Broth PowderBone broth claims are growing, up 30 percent in 2017/H1, when compared to 2015. 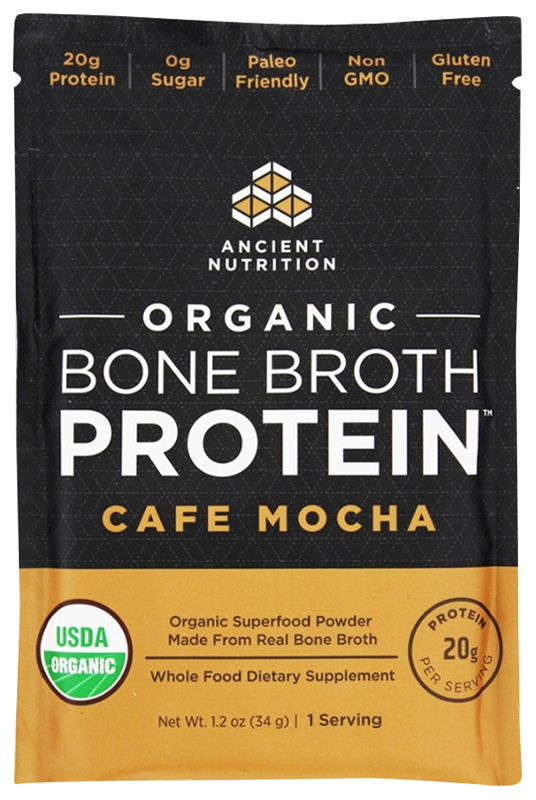 For example, Bonafide Provisions has launched Drinkable Veggies Bone Broth: Revive, a product containing “a combination of organic carrots, organic fennel, organic turmeric, Celtic sea salt and organic bone broth.” It contains 6-11g of protein per serving. The US bone broth trend is being driven by small-sized companies. According to the market researcher, of the top 100 sales based companies within the food & beverage space, only General Mills and McCormick have a product with bone broth in the US market. This in itself is the result of several acquisitions. General Mills acquired Epic in 2016 and McCormick acquired Kitchen Basics in 2011. 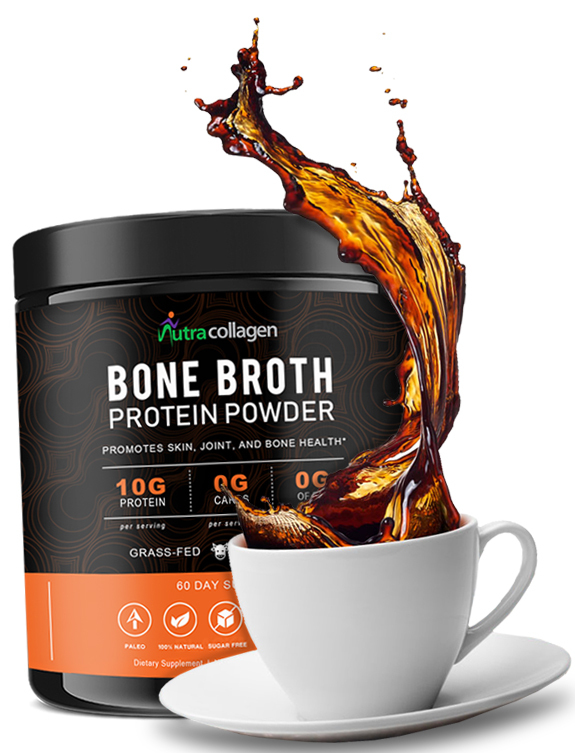 In early 2018, Ancient Nutrition, a bone broth protein and collagen supplement maker, secured US$103 million in funding through strategic minority investment led by VMG Partners. Proving the above, smaller companies like BRU Broth and Protein Essentials have noted the significance of bone broth by dedicating whole ranges of products with it as the basis. BRU Broth, in fact, uses only bone broth as the basic ingredient for its range of vegetable and fruit pressed juices. Preparing bone broth can be easily done at home but the busy, hectic lifestyles that consumers now often lead does not allow time for such a “luxury.” This is why NPD is expected to grow and manufacturers are exploring new opportunities in bone broth applications to meet this growing trend. Typically, bone broth products consist of a blend of collagen peptides, gelatin and a mix of herbs and seasonings, according to Huang. Like in the case of “Insta-Broth” by Protein Essentials in the US. “This product is a good example of a thick, creamy soup packed with collagen and vegetables for a nutritious and tasty treat that can be prepared in less than ten minutes from a powder sachet, that makes it easy to carry around for on-the-go consumption,” Huang says. Additionally, Essentia has promoted bone broth powders in North America for a couple of years now. “In 2018 we launched a new organic beef bone broth for our international region. These clean label ingredients are an ideal base for many pre-made bone broth products – such as RTD bone broth, bone broth powder mixes, protein-enriched instant noodle soups and other nutrient-dense soups and beverages,” Plats explains. Click to EnlargeDoes bone broth warrant more research? A recent study, published in the Journal of Agricultural and Food Chemistry, found that ham bones contain peptides that have cardioprotective effects. Professor Leticia Mora and her team ground up the bones and simulated conditions of cooking and human digestion. Then, they examined whether the bone samples could block the activities of several enzymes involved in cardiovascular disease. The researchers found that the bone peptides, most of which were derived from collagen and hemoglobin proteins, inhibited the enzymes even after heating and simulated digestion. In fact, these treatments released additional bioactive peptides, suggesting that the use of ham bones to make broths and stews could have a positive impact on cardiovascular health. Despite studies pointing to bone broth’s health benefits, there is still more research warranted and some ambiguation still exists. “Unfortunately, there are a lot of self-proclaimed dietary experts out there, who are promoting bone broth as an elixir that can cure almost anything,” notes Plats. “At Essentia, we are very careful about making unsupported claims. We stick to claims backed by scientific studies and we recognize bone broth as a tasty and healthy ingredient packed with proteins that are easily absorbed by the human body,” she concludes.